products, music and everything else that you can think of. I have been known to play online games such as checkers, monopoly, and others but have never been involved in online reality games. I don't know why but a couple of months ago, I registered with Evony and began playing. Once registered, I had a town that I had to name and build up. The game first reminded me of the old Sim games, where you had to build up your population and build the population by keeping residents happy. I would soon discover than Evony is much more than that though. One thing that really lures people into Evony is that it is free to play. Yes, absolutely free, though paying for tokens can really enhance your game experience and speed things up. I have not paid a penny though playing, and though I may getting things done a bit slower than a player who pays for tokens, my towns and military have been growing at a decent pace. Your goal on Evony is to build up your city and army in order to expand your territory and conquer other enemy players or NPCs. Just as you can attack others though, you can be attacked also. The three main screens of interface is separated into three parts, the world map, the town and the city. In the world map, you’ll find other NPC & player cities, valleys (resource fields) and empty slots where you can conquer to progress further into the game. The city is where you can build farms, sawmills, quarries and iron mines to increase your resource production. The town is where you’ll construct most of your buildings for advancement. Military training and research is also constructed here. The game starts you off in a random (usually the newest) server in an empty town with only a Town Hall and your job is to build up the stranded city, army and slowly conquer your way through. Building new facilities, researching, and training troops requires an X amount of time to complete. The lower level the facility, the quicker it will take. The first building you’ll develop is the cottage which takes 1 min and 15 secs, but the second level will require twice as much time and as more levels are acquired, the longer it will take. Some buildings can even take over 12 hours. Each city in Evony is limited to constructing 1 building at a time. You cannot set a queue to build a second or third building when one is finished. This requires a player to come back and check on the progression very often. Its not about how much time you spend on the game once but how many times you spend on it through out the day. As you acquire more and more cities however, you will have more than enough tasks to spend your whole day playing. Other than gathering resources, consistently upgrading buildings you’ll also need to manage your taxes, population and the loyalty of your citizens. You’ll also need to appoint a mayor which we’ll get to shortly. Unlike most RTS games you’ve played, the ideal tax rate for Evony depends on two major factors, idle or actively playing. The population will effect the amount of gold you’ll receive from taxes, production, and how many units you can recruit into your army. Always having enough resources to continuously construct new buildings may get difficult, thus you’ll need to put good use of the market place. In the market place, you can buy & sell food, lumber, stone and iron. You can even create offers or bids and wait until your price is met. However, there is a small auction fee. Once you’ve created an inn and a feasting hall you can hire a Hero to lead your army or become a Mayor. Each Hero has 3 stats, politics, attack and intelligence. Politics will decreases your cities construction time and resource production. Higher attack increases your combat and how fast your units will be trained. Intelligence shortens the time required for research and scouting ability. Your heroes will acquire experience points through combat, mayor duties or through items. There is an hourly fee for maintaining a hero, and the salary will vary depending on their level. You can dismiss and replace heroes at anytime. A hero is also required to lead your troops into combat. There are a variety of military units available ranging from infantry, archers, cavalries, mechanical units and transporters. All units has a maintenance cost of X amount of food. Their movement, health, attack and defense can be upgraded with research. Training new units will require taking away civilians from your overall population. Once you’ve developed your army and have a hero in place, you’ll need to go to the World Map screen to conquer new lands and territories. There are 3 basic types of land that can be conquered, valleys, empty lots and cities. Valleys provide additional resources, empty lots are used to build new cities and cities can be plundered and if attacked enough times you can even take it over. However, if you are attacking a player city, and if that is their only city, you will not be able to take it over. The combat in Evony is calculated through their algorithm, no actual fighting is visible. Its either a win or loss and the results are reported in writing. You lose x amount, they lose x amount and etc. Attack, defense, health and even movement is factored into the calculation. For example, you’re attacking with warriors, cavalries and archers, the archers will start off in combat because of their range followed by cavalries and then warriors last. In result, if your archers do enough damage, you may win without even going into melee range. Or your cavalries will take more damage than your warriors because they arrived in melee combat first. The rally point has an exercise option which servers a skirmish for battles and will calculate the results. Your research and hero attributes are not factored but it does give you an idea of what to attack with. As your city grows, you will gain Prestige points which is basically a rating of how well you are doing. There is an overall ranking that is compared among all other players in your city as well. As you progress, you will be able to acquire new titles and ranks. Some ranks are extremely difficult to acquire, it requires gold and medals (which are very rare to find). The medal drop rates on new servers are about .1% or less. The easiest way is to spend a few dollars and purchase the medals you’ll need. The higher the rank, the more cities you can control, up to a total of 9. There are many different types of items available in Evony which can help speed your production, moving your city location, experience points and much much more. When you first start, you’re given a TON of items to try out and help enhance your gameplay. Items can also be acquired by quest rewards and using real money. Alliances are what most MMO players know as guild or clans. By joining with other alliances, you can have friends who can offer assistance through knowledge, resources, raids and much more. Possibly even scaring another player from attacking you if they know you’re in a well rounded alliance. Each alliance can only have a maximum of 100 players and have a ranking of their own. Evony is a very addictive game so whether that is a good thing or a bad thing, one has to judge themselves. 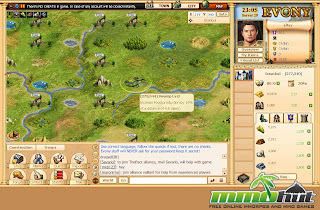 I really enjoy the game as I usually am doing other things on the Internet and always keep a browser open with Evony. Lately, my towns had really been building up lots of resources in the millions but then it finally happened. I was attacked by someone with a way stronger army than mine and all of my resources were taken. My goal now, to build up a strong military and get revenge on this guy. Will take some time though! Evony is a very good game, if you are willing to fork over a few dollars, you can really get a upper hand in Evony. I just wanted to give an update on my Evony play. It has been a couple of years since I regularly played and wrote my final review up above. Why did I quit? It was absolutely too time consuming! It is a game that never ends and that you will be playing day and night as the game is always active. I had fun with my initial play though, I had joined an alliance and it was fun teaming up with allies and talking strategies against enemies. My alliance even had a spy from an enemy alliance join our alliance to try and get information from us. I honestly could not keep up with it as I am a very busy person. I'll tell you one thing though - Luckily these type of games were not around when I was a teenager or else I would have been completely hooked. A couple months ago I tried to rebuild my cities and start playing again but after a couple of weeks remembered why I had quit in the first place. I just do not have enough time for Evony!!! Great game - Yes. Healthy - Probably not as too much of a commitment is involved. If you are a top player on Evony you might want to get some new hobbies. I'm kidding - or am I?